A racing refrain this year is that 2011 has been somewhat lackluster. No big emerging star, no clear choice in many Eclipse categories, few breathtaking performances. For many of us, though, the transcendent times in racing come on small stages, in quiet moments; memories are made when we don’t expect them to be, and not when the whole world (such as it is, when it comes to racing) is watching. Learning last February that I’d been invited to join the voting committee for the Hall of Fame was among the most humbling and exciting things that’s happened to me since I started writing about racing. An honor on its own, it was made all the more meaningful by my family’s erstwhile connection to the Museum. Bad news came later that month when we learned that Giant Moon had died unexpectedly from laminitis during a winter freshening at the farm. He was always fun to watch on the track, always game, and a favorite to visit on the backstretch. What a blow to his connections, who adored him. Last March I wrote about Tom Fool, trained by Hall of Famer John Gaver; what a treat it was when his grandson left a comment. Gaver III is a trainer himself, and someone that I am now pleased to call a friend. Racing history is indeed alive and well and in good hands. A few weeks later, I was wandering a Gulfstream shedrow one Sunday morning when I came across an imposing, genial, and curious face. Later than afternoon, he nearly stole the Florida Derby, settling instead for second before going on to win the Preakness. 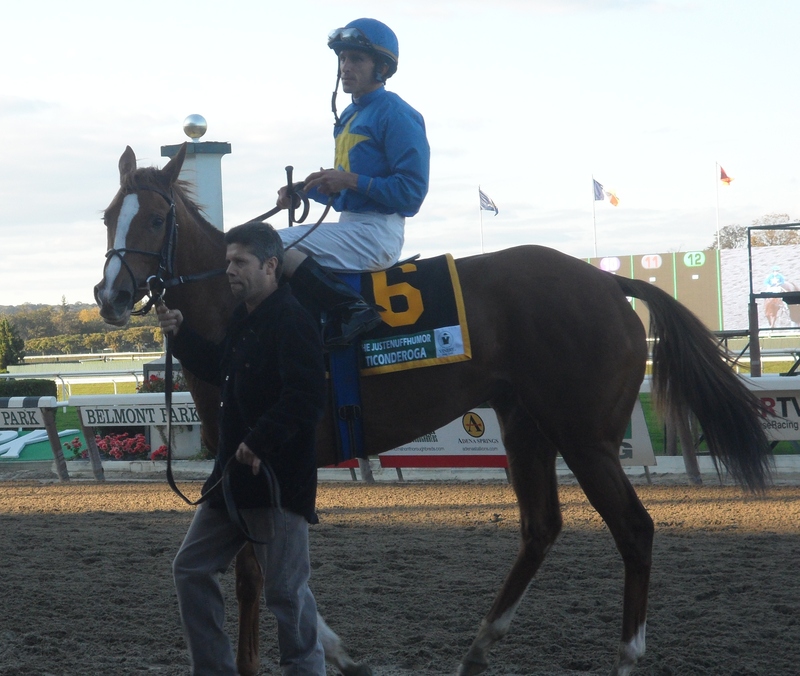 Watching Shackleford show up on every big race day was one of the joys of 2011. Anyone who reads here regularly knows that I think that the Kentucky Derby is pretty much an over-hyped affair that gets way too much significance given its results; nonetheless, it was pretty cool to attend my first one. And while Uncle Mo dominated the pre-race narrative, it was his jockey, John Velazquez, who got to carry the blanket of roses a day after learning that his scheduled mount would be scratched. That’s the Derby story I’ll remember. 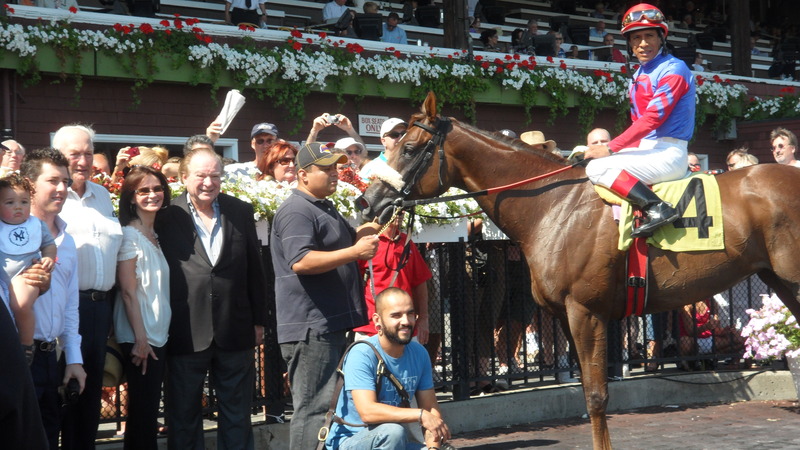 My attachment to Winter Memories began last year, in the Miss Grillo at Belmont, October 2010, but she dominated my racing life in 2011, getting to the winner’s circle in four of six starts, most memorably in the Garden City in September. Talking to her connections – owner/breeder John Phillips of Darby Dan and Phillips Racing, trainer Jimmy Toner – was always an unqualified pleasure, as was recognizing her pedigree, going back five generations in the Darby Dan family. Her breathtaking – literally, for me – win in the Garden City is one of five races on which you can vote for NYRA Race of the Year. Last summer, the Saratogian asked me to write profiles of the three Hall of Fame inductees elected by the Historic Review Committee: trainer Matthew Byrnes, horse Duke of Magenta, and jockey Shelby “Pike” Barnes. I became so fascinated with Barnes’ life that I continued my research for a feature in the Travers Stakes program; Barnes won the 1889 Travers on Long Dance. Seldom have I been more absorbed in researching and writing; Barnes’ story is fascinating. A year ago this time, I knew almost nothing about Lasix. Feeling that that was something of an irresponsible position, I attended every racing meeting on the topic I could, including a full-day “summit” at Belmont. I learned a lot, but feel no closer to developing a strong opinion on the matter than I did a year ago. It’s Tricky, Turbulent Descent, and Ask the Moon made racing memories for me this year. It’s Tricky made eight starts, finishing first four times and second three times, beaten twice by Royal Delta and once by Plum Pretty. She has a quirky personality that her trainer, Kiaran McLaughlin, made the most of, one that kept her in his barn even when she raced in Godolphin blue. I met Turbulent Descent through some of her owners, who contacted me last spring to ask advice about Belmont. We’ve become friends and I’ve gotten to follow this filly and them through much of the year. In six starts this year she’s got three wins (two Grade 1’s) and two seconds, faltering in the sandy Belmont slop in the Acorn and the Breeders’ Cup Filly and Mare Sprint. Her Test was one of the highlights of Saratoga, and she’ll close out 2011 in the La Brea on Saturday. Ask the Moon became a Saratoga star at age six. Before the Grade 1 Ruffian on July 31, she’d made 30 starts with eight wins, none of them in graded stakes. In the paddock at Saratoga she looked outstanding, which I noted to a friend…watching her cruise down the stretch to win by more than five lengths at 18-1, I rued not backing up that opinion with a wager. On closing weekend, Ask the Moon came back to win the Grade 1 Personal Ensign by nearly three. Her only two starts at Saratoga, her only two graded stakes wins, both Grade 1’s. A more modest filly made memories at Saratoga, too, when Precious Soul, a half-sister to Saratoga standout Society Selection, won an allowance race for the same connections as her more famous sibling, owner Irving M. Cowan and trainer Allen Jerkens. She’s not in the same class as Society Selection, but seeing those silks and those faces in the Saratoga winner’s circle was something special. If you love Saratoga history, you thrilled when The Spa: Saratoga’s Legendary Race Course came out last summer. Paul Roberts and Isabelle Taylor’s detailed and accessible history of the architecture at the track was as absorbing as any racing book I’ve read, and it’s essential reading for anyone who loves Saratoga. The Spa meet kicked off with an impressive filly breaking her maiden, and before the week was out, two new Saratoga stars had made their names in print and on television. 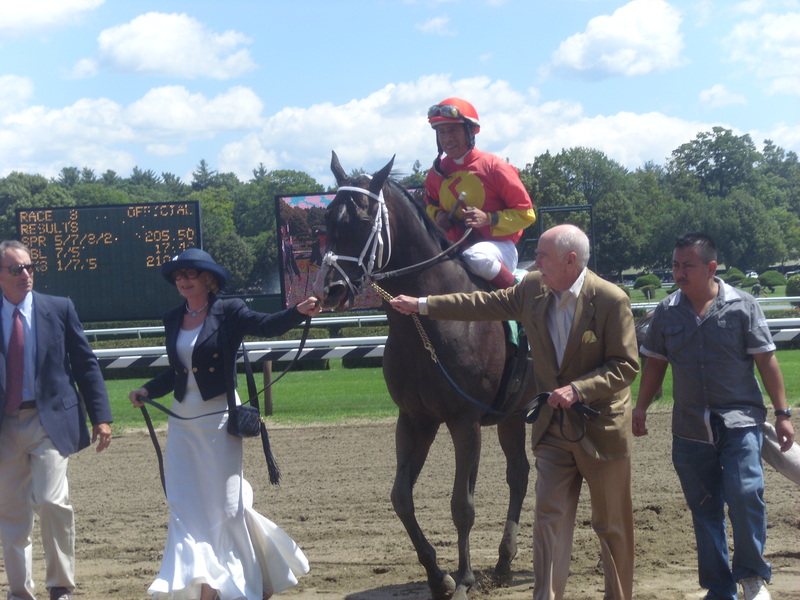 My Miss Aurelia got the first of her four wins in an undefeated 2011 when she won a maiden race on July 22; that afternoon, Lucky the kitten made her Saratoga début, too, in My Miss Aurelia’s barn. Both of them would go on to much greater fame before the year was out. Hockey and horse racing intersected at Saratoga when Sean Avery won the Grade 1 Vanderbilt in early August; a few weeks later, B Shanny broke his maiden in his second start. Neither horse has raced since, both sidelined due to injury, but let’s hope we get to see them again before the current hockey season comes to an end. The final highlight of the Saratoga meet was hometown favorite Teresa Pompay getting her first Grade 1 win in the Hopeful with Currency Swap. He raced only twice in 2011, both at Saratoga, both wins; Breeders’ Cup hopes were dashed when a minor injury put him on the sidelines until 2012. The Hopeful was not the prettiest of races, especially for nephew Backstretch, who had Trinniberg at 68-1, but I’m looking forward to Currency Swap’s return. Back at Belmont, Showcase Day presented a parade of Backstretch favorites in the winner’s circle. Standing in the paddock before the Hudson, in a sort of Ruffian Handicap/déjà vu moment, I said, “Doesn’t General Maximus look awesome?” And in double déjà vu, I watched him sail to the finish line, unencumbered by a dime of my money. Unfortunately, General Maximus is on the list of sad memories, too, as he broke down fatally in his next start. David Donk’s Hessonite had quite a year, making six starts and ending with a record of 4-1-1-, including a win over colts in a New York Stallion Series race at Saratoga. She ended her season with a win in the Ticonderoga and is off on the farm for the winter. We’ll see her in 2012. And capping Showcase Day was the return of Haynesfield to the winner’s circle when he repeated his 2009 win in the Empire Classic. Between those two victories he’d won the Discovery, the Suburban, and the Jockey Club Gold Cup; he retired last month and will stand at Airdrie in Kentucky. A couple of minutes later (it took longer this time – it was, after all, the Marathon), my cell phone vibrated with a text. It was from that Aqueduct friend. “Tell me you bet him,” it read. Wins and losses, triumph and sadness…racing 2011 is nearly at an end. We’ve got three days left to make racing memories, and then we turn the page of whatever racing-related calendar that we’ll pick up on New Year’s Day or that we got for Christmas…and we get to start all over again. We are lucky indeed. We’ve got through this racing year together, and if you’ve hung in there through this much-too-long stroll through the past 12 months, let’s end the year together, too: what will you remember from racing 2011? 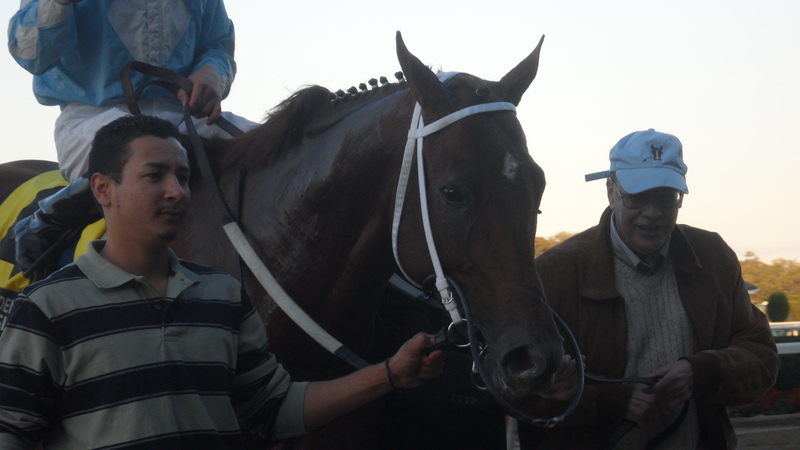 December 29, 2011 in Brooklyn Backstretch. I share some of your favorite moments – Winter Memories thrilling Garden City, Ask the Moon in the Ruffian (been following her since last year! ), Shackelford running like his tail was on fire in the Preakness. Seeing Goldi and Havre de Grace and Giant Oak at the BC, and countless others that I’ve long admired but only seen on the small screen. Getting to meet and hug and kiss Rachel at Stonestreet, and Curlin, AP Indy and Quality Road and the others at Lane’s End. Seeing Rapid Redux win to tie Citation’s record, not a small achievement at any level of racing. THREE trips to KY in one year, all memorable in their own ways. Whew I guess I’ve had more racing excitement than normal in 2011 and definitely looking forward to 2012! Happy New Year to all the Backstretch family and readers! I have been a race fan for 35 years, having grown up near Belmont and riding my bike their as a kid. 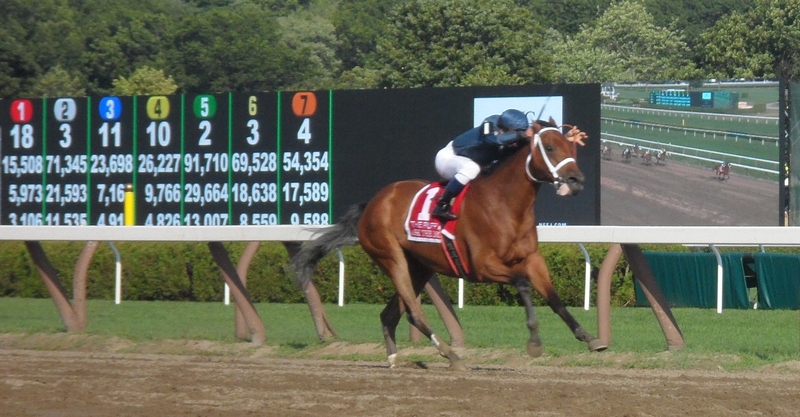 But in 2011 my fanaticism reached a new level after seeing Winter Memories win the Lake George in July at Saratoga. I swear she is looking at the crowd as she easily charged past horses down the stretch. Thanks for great writing and Happy New Year! Hi Teresa, Happy New Year to you and all of your Brooklyn Backstretch fans. And, how about those Rangers and those Giants! Winter Memories was was awesome in New York. Let’s see how she returns this year. Afleet Again in the Breeders Cup Marathon? Sometimes it pays to be a little stupid or pre-occupied. 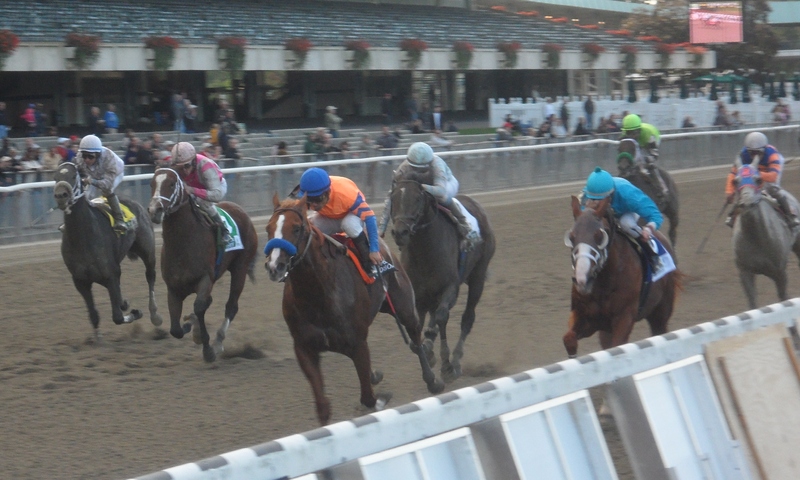 I was playing both Aqueduct and Churchill that day. I had written down my box exacta selection for the upcoming Aqueduct race that day along with the same type of bet for the Marathon. I got to machine at Aqueduct with a minute to post and fumbled with papers to try and enter my bets. I finished just in time. But, when I was standing in front of the television monitor, I noticed something odd on my ticket for the Church race. The numbers on my ticket didn’t match the ones I had actually handicapped and written down prior. I looked at my Aqueduct ticket and it had the same exact numbers (my original choices for the 2 races had been different). The Marathon race was off, that I couldn’t change it, even if I wanted to. All I could do after the Marathon was to keep shaking my head in disbelief over my ineptness and hitting the Marathon exacta with my numbers/choices that I picked for the Aqueduct race. Your hitting of the BC Marathon exacta by mistake reminds me of one instance in 1990 where I actually hit a double exacta that paid over $1,100 by mistake (that was a special wager New York City OTB used to offer on Thursdays and Saturdays in the 1980s and early ’90s where you picked exactas in the last race at whatever NYRA track was running and in usually the first triple (trifecta) race at Roosevelt or Yonkers, usually the 3rd or 4th race, though it also was sometimes offered when there were two “special event” races on the same day in addition). BTW, I noticed a new setup for the blog as well! You had quite a racing year, Linda…now we just have to get you to Saratoga. Isn’t she terrific, Robert? One of the horses that really made my racing year. I never got sick of writing about her. August and Walt, hey, at least I can take credit for actually picking Afleet Again…even if not a second of handicapping went into it! Yes, good to see the Rangers winning — the Winter Classic was a pretty fun way to spend the last day of vacation — though I shied from making the trip down there and watched from the comfort of home.